Illuminate your imagination with the Wood Designs Brilliant Light Table 30". 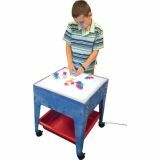 This glowing and durable activity table provides a range of colors for all your sensory play needs. Easily trace images with our 18" x 17" opaque acrylic sheet. Teach kids about color mixing on our evenly lit surface. Control over 20 static colors with options to dim, jump, fade and mix with our remote. The eco-friendly multi-color LED strips provides up to 30,000 hours of bright chromatic light. Below the light table there is a generously sized storage self for quick clean ups. Table is constructed with high quality Birch plywood on all sides. All wooden surfaces are stain, scratch and water resistant with our exclusive Tuff-Gloss UV finish. The LED The unit's dimensions are 18"H x 30 “W x 22.5 “D. Simply plug this into any 110 volt outlet and you're ready to go! The LED strip and acrylic surface comes with a 1 year warranty. The wooden frame comes with a lifetime warranty. Light sensory toys not included. lluminate your imagination with the Wood Designs Brilliant Light Table 30". 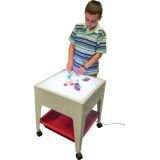 This glowing and durable activity table provides a range of colors for all your sensory play needs. Easily trace images with our 18" x 17" opaque acrylic sheet. Teach kids about color mixing on our evenly lit surface. Control over 20 static colors with options to dim, jump, fade and mix with our remote. The eco-friendly multi-color LED strips provides up to 50,000 hours of bright chromatic light. Table is constructed with high quality Birch plywood on all sides. All wooden surfaces are stain, scratch and water resistant with our exclusive Tuff-Gloss UV finish. The LED The unit's dimensions are 18"H x 30 “W x 22.5 “D. Simply plug this into any 110 volt outlet and you're ready to go! 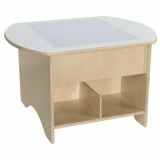 Illuminate your imagination with the Wood Designs Brilliant Light Table 48” without Storage. This glowing and durable activity table provides a range of colors for all your sensory play needs. Easily trace images with our large 44” x 18.5” opaque acrylic sheet. Teach kids about color mixing on our evenly lit surface. Control over 20 static colors with options to dim, jump, fade and mix with our remote. The eco-friendly multi-color LED strips provides up to 30,000 hours of bright chromatic light. Below the light table there is a generously sized storage self for quick clean ups. 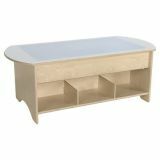 Table is constructed with high quality Birch plywood on all sides. All wooden surfaces are stain, scratch and water resistant with our exclusive Tuff-Gloss UV finish. The LED The unit's dimensions are 18"H x 48 “W x 22.5 “D. Simply plug this fully assembled light table into any 110 volt outlet and you're ready to go! Illuminate your imagination with the Wood Designs Brilliant Light Table 48” without Storage. 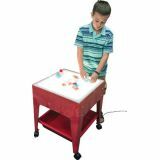 This glowing and durable activity table provides a range of colors for all your sensory play needs. Easily trace images with our large 44” x 18.5” opaque acrylic sheet. Teach kids about color mixing on our evenly lit surface. Control over 20 static colors with options to dim, jump, fade and mix with our remote. The eco-friendly multi-color LED strips provides up to 30,000 hours of bright chromatic light. 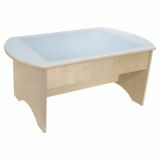 Table is constructed with high quality Birch plywood on all sides. All wooden surfaces are stain, scratch and water resistant with our exclusive Tuff-Gloss UV finish. The LED The unit's dimensions are 18"H x 48 “W x 22.5 “D. Simply plug this fully assembled light table into any 110 volt outlet and you're ready to go! Giant sized multifunctional tray measuring 22.25" x 17.32" x 4" is designed to fit over the TickiT® Ultra Bright LED Light Panel (sold separately) or it can be used on a desk, on the floor - inside or out. Made from clear polycarbonate giving it incredible strength and longevity in the classroom where its rigidity means that even when filled with water it can be lifted and moved around without it flexing. In addition to its everyday uses with a variety of liquids and textures for general artwork, the tray has been cleverly designed to fit over the TickiT® Ultra Bright LED Light Panel to provide a space for the illumination of activities. Children will enjoy using this when making patterns, drawing, painting or using food substances (tapioca, rice, pasta, lentils, etc...) to create interesting textures and effects. Also brilliant for use with inks, dyes and for marbling. 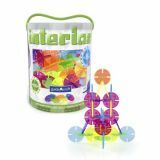 Interlox Discs provide colorful, easily interlocking building pieces to engage children in open-ended play. Discs are made of colorful, translucent plastic with multiple notches for flexible building. Use the five beautiful colors to explore color theory on the LED Light Tablet or for other light and color activities. Children explore the concepts of symmetry and asymmetry while strengthening their design, structure and engineering skills. Use with the original Interlox for even more combinations. Ages 2+. Build, design and create with Interlox! 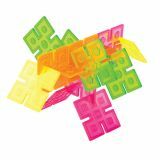 No hardware or tools necessary; simply clip the edges together to create an unlimited array of constructions: buildings, people, robots, animals and more. Explore symmetry versus asymmetry, discover color combinations, and strengthens design, structure, and balance skills. Plastic translucent panels feature inset shape details in five beautiful colors. Ages 2+.